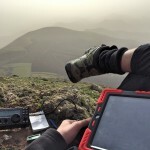 As part of my XYL’s birthday we visited the Brecon Beacons for a weekend of walking. 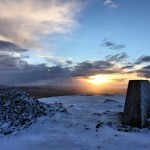 While here I activated two SOTA summits, the first being Sugar Loaf Mountain (GW/SW-011 – see my write up), the second Coity Mountain (GW/SW-012), this being completely unplanned, but a pleasant surprise at 2 points plus 3 winter bonus points. After a day of early spring sunshine on Saturday, we woke up on Sunday to find it pouring down with rain. As we sat having breakfast we debated what to do, considering the heavy rain we decided on the Big Pit National Coal Museum, in order to stay relatively dry. we were happy to go back up the lift shaft and see daylight again. It’s very interesting but I was crouched over for most of my time underground! Upon leaving the mine I discovered it was still raining, this could potentially scupper my improvised activation. After having a cup of tea and some Welsh cakes we went back to the car park and debated whether we fancied a walk or should just drive back to Hertfordshire. After about 15 minutes of sitting in the car the sky seemed to clear up to a dull grey colour with a distinct lack of precipitation. Activation on! Following the reports from previous activators we walked via the Reservoir, we found out soon enough that this was wrong and basically led us to a long fence with no way over and boggy land. At this point my XYL had wet feet so she headed back to the car and left me to carry on with the promise that I’d be super quick on this activation and wouldn’t proceed if it got anymore tricky (see further below for the correct path!). I setup the dipole for 40m and spotted myself via SMS, warning chasers that this would be a super quick activation. 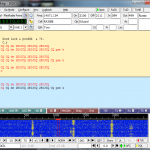 Within 3 minutes I’d netted the necessary 4 QSO’s to activate the summit. 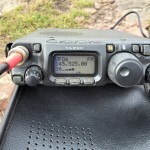 The first QSO was with GB2GM from the Marconi Centre down at the Lizard, Poldu in Cornwall. This is the location of Marconi’s first two way transmission in 1901 across the Atlantic from Poldhu to Cape Cod Massachusetts. So I was happy to get this in the log and intend to visit the next time I’m down in Cornwall. After packing up and starting my descent, I had the benefit of being high up and noticed a faint path back to the car park… indeed this is the one I probably should have followed on the way up! I followed this path and although wet, missed the worst of the bogs and the going was much easier. If you follow this path you will have little trouble with the summit! I have mixed feelings about this activation, on the plus side it was unexpected, worth 5 points and was set in an interesting and historic location. On the other hand the continuous grey weather really added to the vibe of industrial decay and the walk up was miserable, wading through bogs with no discernible path. On top of this I felt guilty for bolting after 4 contacts leaving a hungry pileup. On the other hand I ascertained that my new walking boots are indeed waterproof, made it back to the car in good time and drove for a solid 3 hours all the way back home and relations with the XYL remained warm! 10 points from two summits… successful weekend I say!